Puck Custom Enterprises, an industry-leading manure application equipment manufacturer, is continuing to push forward with its technological efforts. The company, known for its innovative approach to fluid delivery products, most recently upgraded its trademark LightSpeed software to the improved “LightSpeed Pro.” This new version brings customers remote pump control with a higher level of efficiency and ease of use. This software program was developed by PCE to enable automated pump control, whether for manure application or other fluid delivery uses. While it is an optional program for PCE customers, it syncs with the LightSpeed IQ technology that comes standard on all Puck Custom Enterprises pumps. LightSpeed IQ is the only program on the market that offers in-depth pump diagnostics and insight, and when paired with LightSpeed Pro, gives users remote monitoring and control of their pumps in almost real time. The LightSpeed technology can be operated on any tablet, phone or laptop in the cab of the applicator tractor without the need for any other hardware. It can also be outfitted and adapted to any third-party pump by PCE’s service crew, giving all applicators the opportunity to adopt the high-tech system. LightSpeed Pro is the newest iteration of PCE’s automated pump control software, which first launched in 2007. 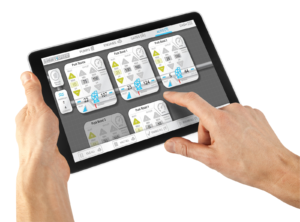 More than a decade later, LightSpeed Pro includes a redesign geared toward ease of use and navigation, streamlined pump control and more in-depth diagnostics, in addition to full site-mapping capabilities. This feature is particularly useful for custom applicators and row crop farmers, who are now able to set up job sites, map the location of pumps and hoses, and lay out fields within LightSpeed Pro. PCE designed and built the LightSpeed Pro and LightSpeed IQ software entirely in-house, which gives them the ability to react quickly to changes in the market and customers’ needs. Compatible with nearly any connected device, it has a half-second update rate that results in near real-time visualization and pump control. Unlike many competitors’ technology, LightSpeed also offers detailed diagnostics, helping applicators to find and address pump problems as they arise. According to Matt Lindemann, PCE’s technology specialist, the company’s 11 years of experience with pump control software has allowed them to hone LightSpeed Pro into an invaluable tool for applicators — with a 99 percent uptime guarantee. LightSpeed Pro is developed and overseen by a PCE team with over 75 years of involvement in the industry, and even used by Puck Custom Enterprise employees on the application side of the business. As the LightSpeed Pro software becomes more robust and wide-ranging, PCE looks to continue innovating and updating its technology to meet its customers’ needs and improve their efficiency on the job.